Everybody knows the situation when a car has been parked in the sun. Especially the van type cars with large windows become incredibly hot inside so that it is almost not possible to touch the steering wheel. 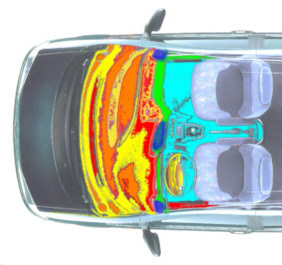 The picture shows the superimposed thermal image on the dashboard of a van. The temperatures on the dashboard and the steering wheel can reach over 80°C (176°F), which has to be compensated by the air conditioning and costs gas. The windshield is not only transparent for the visible, it is transparent for most of the solar spectrum. Once the rays of the sun have passed the windshield they will be absorbed by the dark dashboard and heat it up to unpleasantly high temperatures. Now the dashboard itself starts radiating but at longer wavelengths in the thermal infrared and at these wavelengths the windshield is not transparent anymore. The heat is trapped in the car and has yet to be compensated by the air conditioning. IPS has developed plastic compounds and top coats which are dark in the visible but reflective in the invisible part of the solar spectrum; therefore significantly less solar energy will be absorbed by the dashboard or the steering wheel. This results in energy savings on gas. Another application of IPS solar reflective technology in cars are dark, especially black, solar reflective leather seats. The driver seat of the convertible is covered with a black solar reflective leather. The infrared image shows that this seat is much cooler. 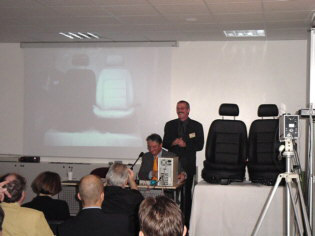 In this presentation two black leather seats have been shown which were totally identical in the visible. The picture on the screen in the background has been taken with a camera which can “see” beyond the visible in the near infrared where the sun still has 50% power. Here the seat looks reflective white. Due to the lower temperatures solar reflective materials will reduce the heat stress of the driver and the passengers so that the air conditioning can be switched to a lower level, which saves energy and increases the thermal comfort as the cold draft of the A/C is less. 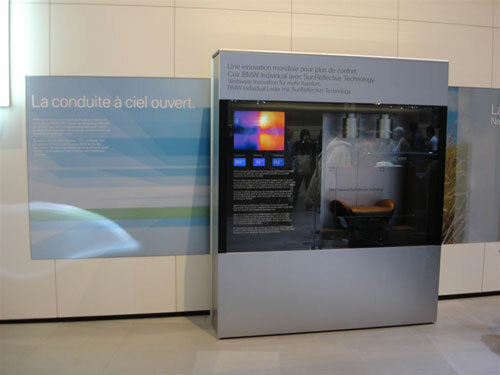 BMW has presented solar reflective leather seats for their convertibles at an exhibition in Paris. 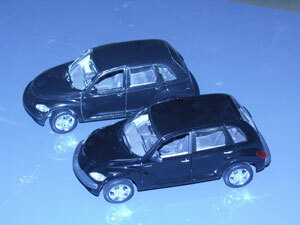 The two photos show two black coated models of a Chrysler PT Cruiser. One model has been coated according to the solar reflective technology. 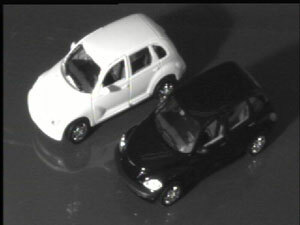 The black and white photo has been taken with a special camera for the near infrared and it shows that the PT Cruiser is white. As 50% of the solar energy is in the near infrared, this car will stay much cooler when exposed to sunlight. For „cool“ leather seats please have a look at www.tfl.com. For “cool” artificial leather applications go to www.hornschuch.de and ask for skai® “cool colors”. For information on solar reflective artificial leather please contact www.hornschuch.de and ask for skai® cool colors for automotive applications.